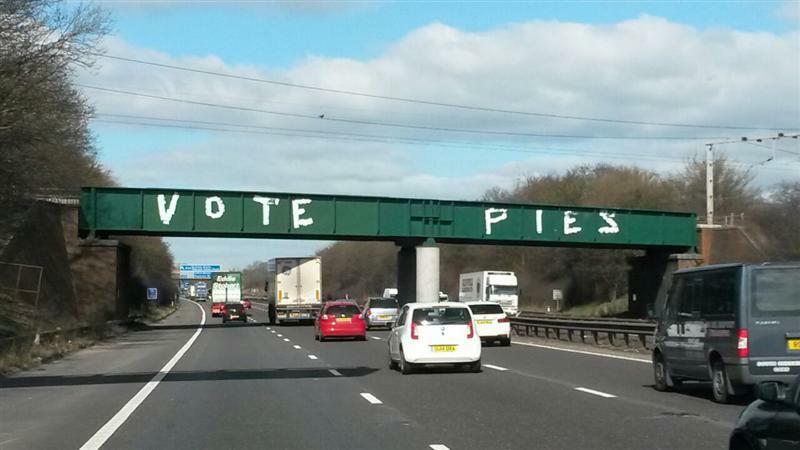 Motorway journeys around the northwest of England have been made a little more interesting in the last few years by the proliferation of Pie slogans on some of the bridges. ‘Pies your time is now’ is one and ‘Vote pies’ another. Those I see most frequently are on the M6 around junction 18 but I hear there are some at the northern end of the M57 at Switch Island and other places. The journey home was otherwise uneventful and we are now relaxing with the dog in front of the fire, planning journeys in 2016.